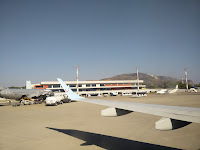 Zakynthos or otherwise known as Zante is a small island in the Ionian sea that has its own airport, making it very easy to reach. And because of that it has also attracted a lot of tourism, which is a good and a bad thing. When you first arrive on the island you are greeted by a small airport with one runway. If the wind is blowing in a bad direction, the pilot will have to land from the appropriate direction. This happened to us, this did however give me a great view of the island when we were circling around it. 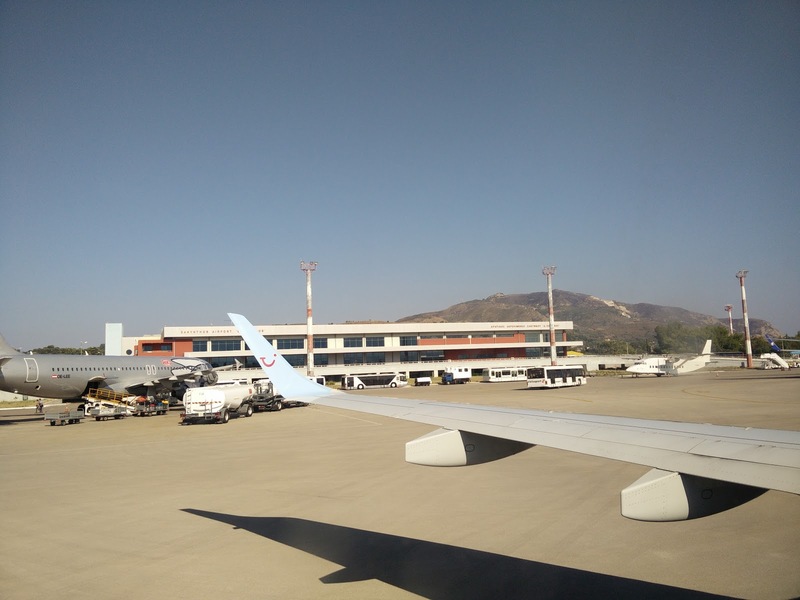 As mentioned the airport is rather small, so if you find your baggage quickly you can be out of the building in 1 minute after taking it off the carousel. One thing you need to know though, if you like clean toilets, its best to wait until you get to your hotel. Its not that bad, but the restrooms need a lot of maintenance right now, especially the ones in the arriving area. 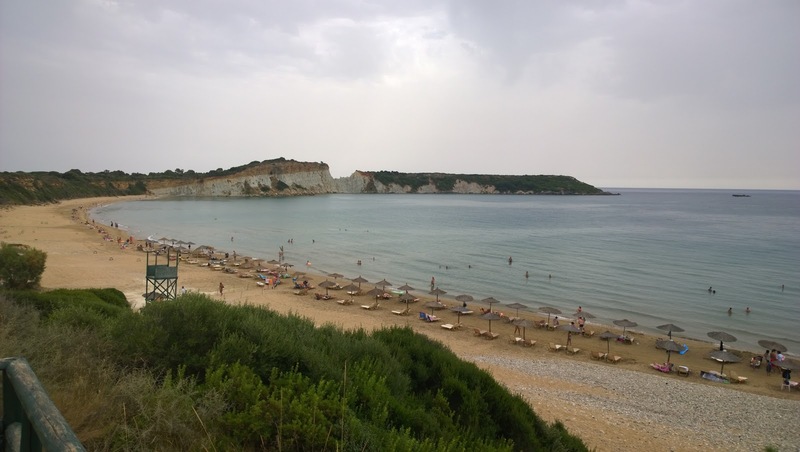 Zakynthos gets quite a bit of rain over the year, and that gives you a nice and green island that is a joy to drive around in. In comparison to a lot of other Islands that do not enjoy as much rainfall. The downside of being such a small island is that many villages are very touristic, aimed mostly at English guests. You will notice that a lot in the breakfast menus. You will also find a lot of pubs and drinking spots catered towards them. The biggest example of this is Laganas. If you don't like touristic beaches and cities... just don't go there. 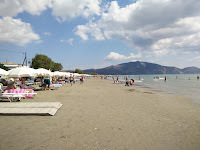 There aren't many good beaches on Zakynthos, the only "big" one is in Laganas which is overpopulated. If you are looking for sandy beaches that are not that busy, you will need to hire a car or go with a tour bus. 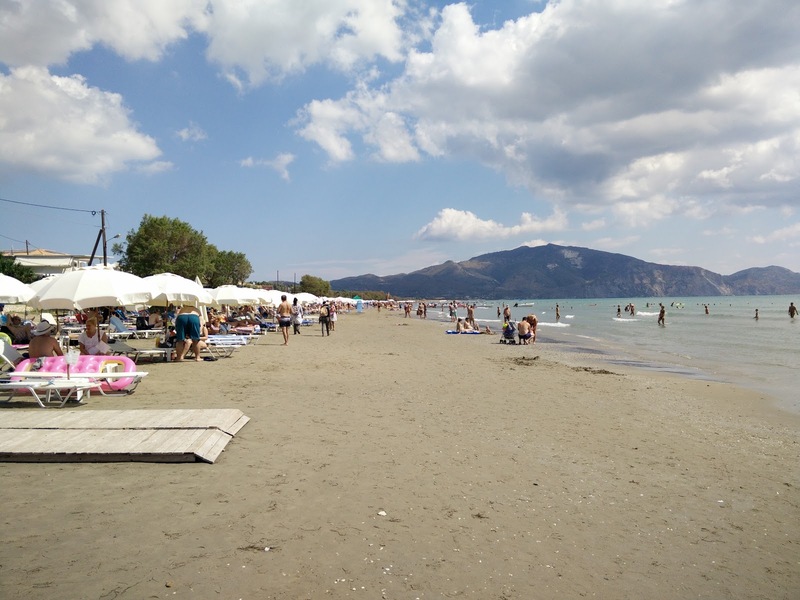 A good one is Gerakas, it is catered towards tourists but close to turtle nests. But this appeared to be one of the few beaches where those nests are adequately protected from people wanting to have a nice day on the beach. Writing about turtle nests should be no surprise to anyone who has already done some research about the island. The big thing about this island is that it is the nesting ground for the Loggerhead sea turtle. So if you want to see turtles you should go during their mating period which is during the summer. 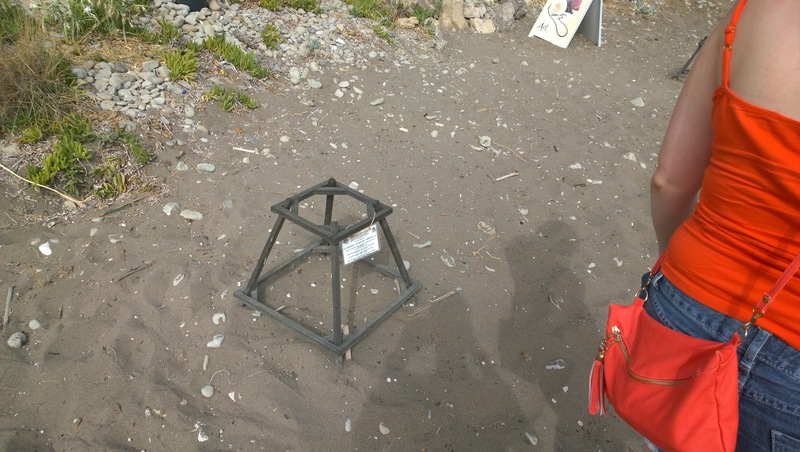 All this is a bit contradictory though, on the one hand you have people protecting the turtles and their nests... and on the other side we have people from the island building tourism around it which disturbs the nests and the turtle habitat. Like mentioned before the Gerakas beach has adequate protection, but most of them don't. Children are running around close to the nests, so there is no doubt some of them are disturbed during the season. It seems tourism won on most beaches.... But at least the nests have been marked! This is a small beach only reachable by boat. It has a Shipwreck on it and you will find enough companies on the island to bring you there. But off course there is a price tag linked to that. There are not that many towns on that side of the island that offer boat tours, so you are looking at at least 20-35€ per person for the boat trip. And for that you are brought to the spot to swim for about 30 mins and visit the beach, but besides the water and the ship there is not much else to do there. On my trip we decided not to go by boat, but to see if we could get to a close spot by car, when we got there there was a small road leading up to a ledge with a view of the beach (but a not so good view of the ship itself as you can see on the picture). There is ample parking space available, but not much else to do there. There is a vending stand for drinks and olive oil, but that is it. If it is not a too hot day, you can take a walk in the neighbourhood. The second thing that is advertised everywhere on the island are the Blue Caves, a lot of the Greek waters are very clear which make them a joy to swim / snorkel in. These caves are no exception. But as with Navagio, you require a boat to easily get there. We read on Tripadvisor that there are stairs down to the caves. But that isn't exactly true, unless you are able to swim at least 1 kilometer in the sea (with strong waves hitting the cliffs) there is no easy way to get there. The good thing is though, that the water is also very clear on the spot where the stairs lead. You can find those stairs here. They are next to a local taverna where you can have something to eat and drink for a decent price. If you decide you want to go to the blue caves and have a rental car, it is best you drive up to the Skinari Lighthouse and Windmill. For only 7€ you can get on a boat there that leaves every 10 minutes, which is a lot cheaper than the cruises that are offered in the cities like Laganas. The last place on the island that is a wonderful thing to see, is Turtle Island. This is an island in the National Marine Park of Zakynthos. It is also the top place for turtle spotting in high season. In Laganas and the cities around the island you can rent boats to get to the small beach on the island. On our trip we decided to just visit the cities surrounding the island to have a look at the island that unsurprisingly looks like a turtle. On our trip we decided to rent a car so we could explore the island at our own pace, this turned out to be a great idea since there is not really another way to get to certain parts of the island like: beaches. The roads can be quite rough and going by bike or walking is just not an option. The island is, as mentioned, very green and very nice to look at. It is split up in half by a mountain range which gives stunning views when driving on top of them. Just make sure you can always make a U-turn, otherwise you might be in a bit of trouble. Especially since there are big drops next to most roads and no guardrails to keep you from going all the way down! Since this island isn't that big, you can get from one side of the island to the other in about 1 hour. So you are never in for a long drive. 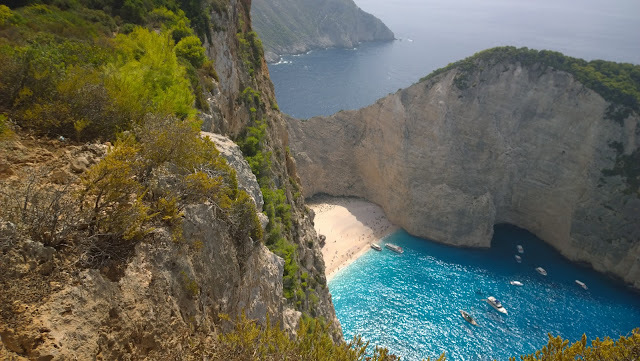 Zakynthos is a beautiful island to explore by car, but has few "things to remember". In a few days you can go and see the entirety of the island and finish exploring if that is your thing, but there just isn't enough to keep you occupied for more than one week.